There’s things that occur when your business is also an art. Sometimes these things are good – we have visual and sonic presentation that’s so unique and inherent to ourselves and genres. However, we also have things that are just.. bad. We have traditions that stunt our artistic growth, and even worse we have concepts that make artists feel as if they have to spend money in places that just aren’t smart. In fact, with the dozens upon dozens of artists and labels I’ve worked with throughout my career – the number one reason they fail, is because they spent money in ridiculous ways. Now, to them – it wasn’t reckless. They were simply spending money in forms that align with “the culture”. But, sometimes following examples from others isn’t always smart – especially in an industry that changes as often as ours does. What worked for folks in the 90’s and 00’s won’t work today in the 2010’s. Especially in terms of money and how we handle ours. Why do we feel the need to throw money at things we don’t understand? The answer is simple: Because we want to rush the process. We invest poorly because we want to speed things up – we work in an industry that’s full of other artists vying for the same spotlight, and thus, we want results NOW. So, we invest money in some shady marketing deals, we pay promoters OUR money for shows, and we feverishly spend cash trying to “look the part”. You can’t rush the process in our industry. It’s like the wind – you can’t control it… but you can harness it. You can redirect it, and you can use it’s power to create larger energy and bigger moves. However, you can never 100% control it. Now, that’s not me saying that you should just throw content out there and hope one day it sticks. You still need to be active. Because with good marketing, good pitches and smart investing you can better your career and better your work to enhance your chances at success. You just can’t…buy it. Money won’t make people like your music. Period. So, instead of throwing money at poor promotions, use it wisely. 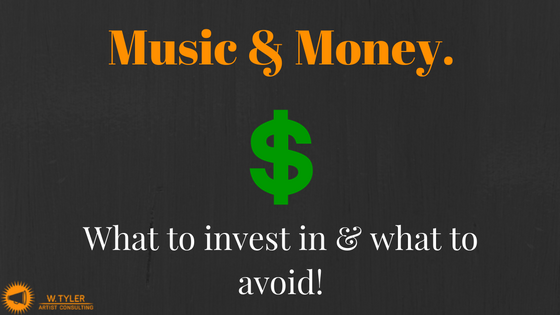 Don’t be like the many artists out there who think they need huge budgets to make moves. For this article, I want to play a little of This vs. That, with the topic being investments. 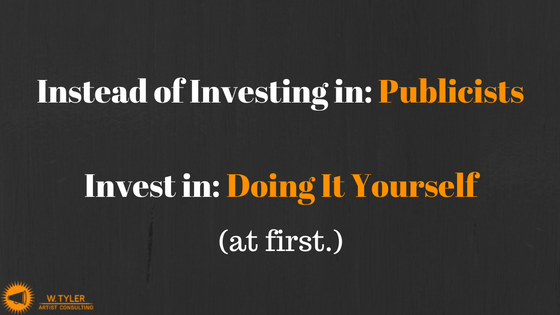 So, instead of investing in A… invest in B..
Let’s knock out one of the tricky ones ASAP. The average PR campaign can range anywhere from $700 to $2,000 per month. You may get an “eblast service” for $500 or so, but you need more than an email to writers. You need to be pitching reporters and building relationships. PR is necessary, there’s also going to be a time where you may need someone with larger connections to navigate your work. However, first – you should always try to pitch your work on your own. Number one, you’re saving money. PR is simple – it’s a good pitch, a good EPK and following up approriately. However, secondly, if you try and try (and try and try) but keep failing – what’s the worst thing that just happened to you? The worst thing that happened was you took some time and learned more about PR. You didn’t see the success you wanted, but you experienced the process. Which is invaluable. You learned about pitching writers, you learned about prepping an EPK. So now, if you do hire a publicist, guess what? You know when to call them out, how to manage them, and what to expect from them during a campaoign. Period. Trying it for yourself just made you a better leader. It’s also common for artists and managers to pitch writers. This is very common – because maybe you don’t want to invest in a publicist for an older track, or a certain campaign. You’d rather just introduce it to writers yourself. Or, you’d like to pitch alongside your publicist. Point is, you don’t always need a publicist, especially ASAP. Yo, and I’m telling you that… as a publicist! 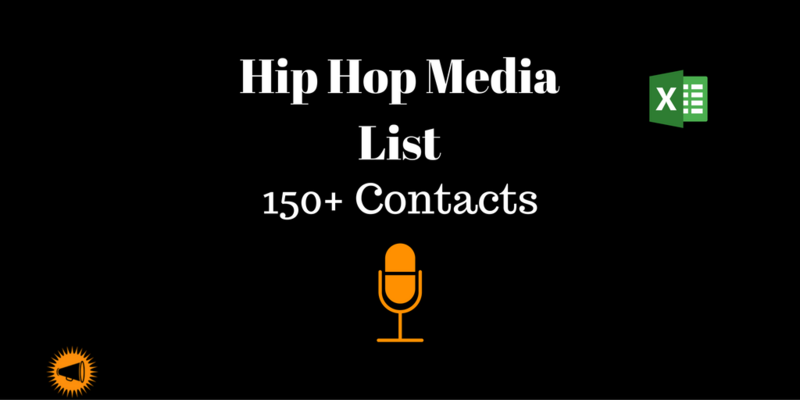 A media list is the list of writers and outlets that you want to target with your release. Writer information is hard to find. Click on the link below, and you’ll find some solid pre-made lists: hip hop, rock, EDM and more. Click it to make your media list building easier! However, if you still want to build your own list, you can find info via free tools like Zoominfo or even simply Googling a writer’s name and see if you can find a contact info on their social media or portfolio. (But again, the above is a $30 investment which is well below the price for a $500+ PR campaign. Plus it saves you time, too!). We’ve discussed pitching previously a few times, like here. However, the main thing you want is for the writer to feel important and not like you’re copying and pasting a link and bio into an email. Talk about a recent piece they wrote, or talk about how you admire their outlet. Make them feel as if you are writing them directly, and not blasting out a link. Look, even major artists send pitches with info on the track and an EPK, why do you think you can get away with a soundcloud link and a copy and paste bio? Be professional. You can have the best list in the world, but with a bad pitch, it’s pointless. Again, we talked about EPKs in depth here, so I won’t go into too much detail. However, an EPK – an online URL one, not a PDF one – is a great resource for writers. It’s a one-stop-shop for them to pull info for a story – and – it makes you look more professional. Reel them in with the pitch, sell them with your music, and assist them/close the deal with an EPK. If you get these tools together, you can start pitching on your own ASAP, and hold off on investing huge bucks in PR or other costly tools. All you need is media list, a pitch, and common sense. Music videos are great, and I’d even dare to say an essential marketing tool … but I find that too many artist jump into investing in one way too fast. I used to work with major labels, right? I’ve also worked with large indies that were distributed by major labels. But the craziest thing to me, is how indie/DIY artists, with limited budgets treat music videos. To a major label – aka a company with HUGE dollars- a music video is a risk. It’s an investment. Typically, a music video is only made after the single is proven in the market. If the single is getting love, they’ll let the single climb the charts, and then once it slips, throw in a music video to get momentum back up. Why? Because they don’t want to lose money investing in a music video, that fans may not even enjoy. So, if a major label, with millions, does market research before putting out a music video – why do artists think that’s the NEXT thing they need to do after leaving the studio? 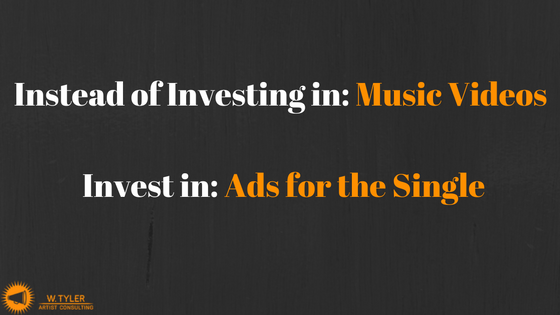 Visuals are good, and music videos are good, however – be careful how you invest. For the same price of a music video, approx. $2,000-5,000 – you could invest in a radio buyer, a series of Facebook/Twitter and IG ads. You could even get studio time or a hot feature for that price. Visuals are good for marketing – so it doesn’t have to be a full-on music video. It could be a well-edited vlog or behind the scenes of you in the studio making a track. A visual doesn’t have to mean a 5K music video. Instead – use that money to boost your single and make sure it’s hot. Take out some inexpensive Twitter ads, YouTube ads and Facebook ads. Then, at the end of the day, you have plenty of budget left over (and time to save) to eventually invest in a music video. But again – don’t think a music video is a must-have. A hot single that generates fans is. Or, use that money to invest in a good PR team (or buying PR resources), use that money in ways to ensure the single is hot before gambling on a video, for a single that may not even do well in the market. One of my largest issues with our industry is “pay for play”, not only do I find it unethetical, but it’s troubling because there’s a generation of artists coming up that genuinely believe paying to perform is normal. But it’s not. Performing and playing for others is a large revenue stream – it’s a way for artists to make money. In fact, it’s the largest and most common way for artists to make money! We don’t have album sales to rely on anymore, all we really have is live shows. However, promoters have found ways to charge AN ARTIST to play THEIR art, so artists pay for exposure and don’t make a dime themselves. They’ve hijacked a way for you to make money through your art. Sure, there are some small local showcases that ask artists to chip-in a few bucks to help rent the venue, and I guess (maybe) that’s okay. But being asked to pay $500 just to perform your own work – that’s just unethical. The issue with this is ROI – Return On Investment. If you pay for $500 each to get on three shows, you just paid $1,500 to perform your own music. But when are you going to see a return on that investment? If you’re moving thousands in merch at these shows, hey maybe you saw a ROI and you’re happy. But I find from personal experience, you might break eve, and make a few bucks, but most of the time, you’re in the red. We must start thinking in terms of ROI and investment, or we’ll go broke. Plain and simple. So, if you pay onto shows, you need to understand, you have to make that money back! Or else you’re playing yourself, and getting played by promoters. And that’s not a dig to promoters, there’s plenty of great promoters, booking agents, booking companies and more that don’t fall into this pay-for-play stuff. However, it’s really becoming a huge issue in our culture, that needs to stop. Quick story: I had a promoter want to charge two of my artists $700 each to open up for T-Pain.. with 6 other dudes.. two hours before the main set. That would be a $1400 investment for the management company, and with six other artists and two hours before T-Pain’s set, it’s likely merch wouldn’t move. We declined. But, we did more then decline. We looked into T-Pain’s touring map and found nearby shows. We contacted the venue, as well as T-Pain’s booking company, and pitched our two artists as opening acts for surrounding shows. And guess what? Our two artists genuinely opened up for T-Pain for $0.00, in fact, they got paid! As well as made a pretty penny off of merch sales. That’s the thing – we think paying for shows is common, and we think that booking looks a certain way and behaves a certain way, but it doesn’t have to. 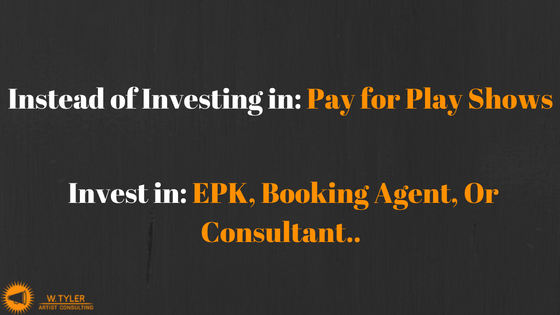 Instead of sinking hundreds into pay-for-play deals, invest in updating your EPK, invest in a one-time session with a consultant who will help you build a booking list and a pitch. Or, better yet, invest in a booking agent who only makes money when you get a gig. These are just a few ways to better navigate your cash. Look, artists today have it hard – you make 0.00025 a penny per stream, and booking shows takes time and effort. So, please – be smart with your money, so you can prolong your career and enjoy your art (and profit! ).